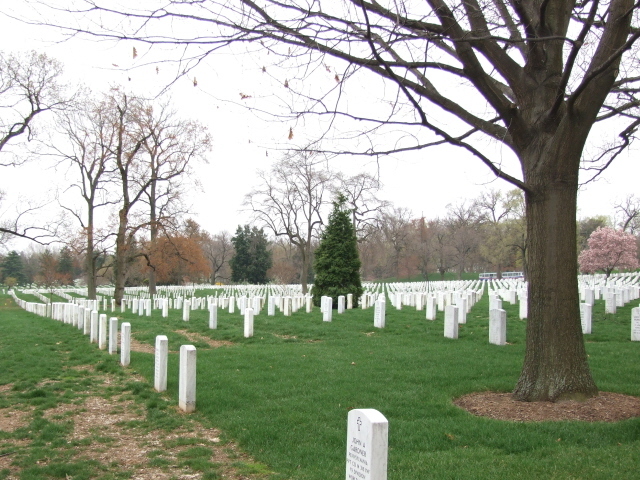 A huge cemetery in Washington D.C., which is primarily the USA's principal military graveyard, hence its designation "National Cemetery". Amongst hundreds of thousands of military personnel of all manner of ranks, there are a number of famous people's graves as well as special monuments that make the place stand out in particular, also for the dark tourist. By sheer number of visitors, in fact, it's one of America's most popular dark tourism destinations. 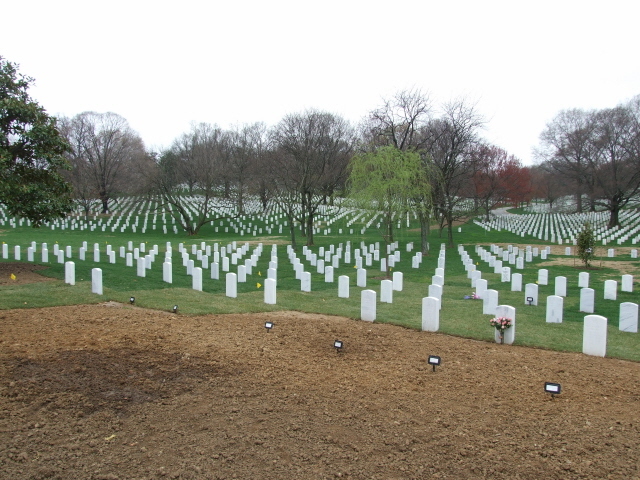 More background information: Over 300,000 casualties from the USA's wars from the revolution to the ongoing conflicts in Iraq and Afghanistan are buried here. It's basically a sea of small white headstones. But there are also some more remarkable monuments and famous graves, some real national monument affairs, with all the patriotic trimmings such sites tend to come with in the USA. The site was established as a cemetery during the American Civil War on the grounds of Arlington House, an early 19th century neo-Greek mansion standing high on a hill above the Potomac. Apart from military personnel there are also other notable people's graves here, including two presidents (JFK and W.H. Taft), explorers, Apollo astronauts, and also the French urban planner of downtown Washington (esp. the Mall) Pierre Charles L'Enfant. With ca. 4 million visitors annually, Arlington National Cemetery is an immensely popular site – at peak times it really can get positively crowded and almost "boisterous" here. In that respect it can be regarded as one of the USA's top dark tourism sites, although most of these visitors can probably only be classed as casual dark tourists. Going by what the place offers the dedicated dark tourist, however, it's rather of secondary importance, easily surpassed by some of the other, darker sites in Washington D.C. proper. Possibly the most famous set of graves of them all, and for many visitors the prime reason for coming here in the first place, is that of the Kennedys. 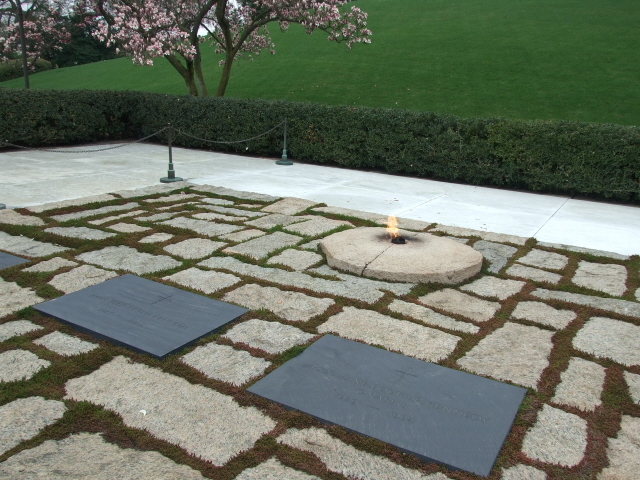 JFK's has an eternal flame next to the simple black name plaque set into the cobbled ground. Next to his is ex-wife Jackie's grave and on either side two smaller plaques honour two of the shortest-lived Kennedys: an unnamed daughter with just one date, 23 August 1956 (date of both birth and death – a stillborn), and Patrick Bouvier Kennedy who only lived from 7 to 9 August 1963, just 15 weeks before his father's assassination in Dallas (see Sixth Floor Museum). A wall with JFK quotations forms the eastern edge of the grave complex. Signs say "do not sit on the wall" – and it is enforced: I even witnessed a disabled man briefly leaning on it being yelled at by the guard on duty not to do so! More notable dead Kennedys are buried nearby, most prominently senators Robert and Edward ("Ted") Kennedy. The former was also assassinated in 1968, the latter died (of a brain tumour) only recently in 2009. 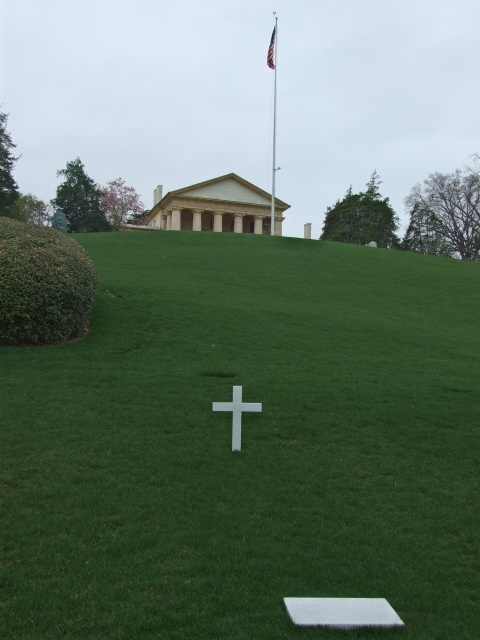 Both graves have simple white marble crosses and separate small name plates on the grassy slopes below Arlington House, which is at the top of the hill overlooking the Kennedy clan section. 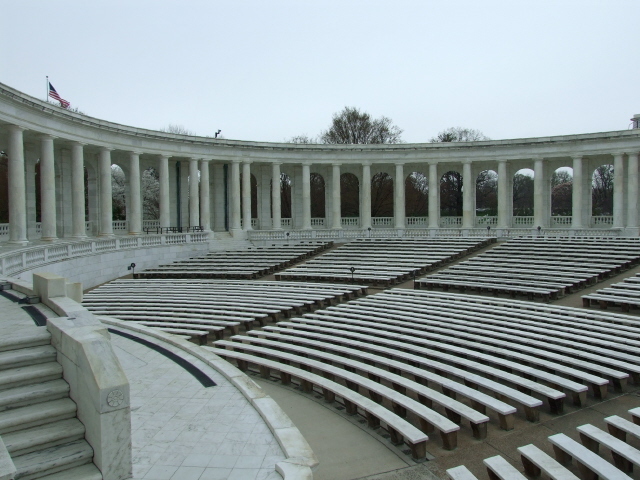 The largest structure at Arlington, however, is the Memorial Amphitheater, where memorial services are held (with great pomp). It's a wide white marble affair of classic Greek theatre inspiration. When nothing important is going on, you can just wander across the "stage" and the rows of seats. I even witnessed a young boy cheekily taking a seat in the central ceremonial, throne-like seat. Behind the Amphitheater, facing the Washington skyline, is the Tomb of the Unknown Soldier – in fact several unknowns, one each from WWI, WWII and the Korean War, another one from the Vietnam War was later identified and reinterred elsewhere. 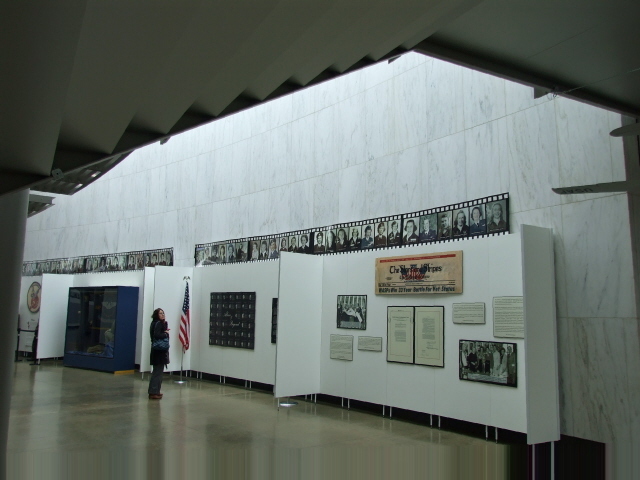 This is probably the second most popular spot (after JFK's grave) in Arlington – perhaps not least because of the soldier parading up and down in front of the tomb while the crowds ogle down from the steps to the back of the Amphitheater building. Changing of the guards scenes are especially popular it seems. The place is also called "The Tomb of the Unknowns" on the official website – and you have to wonder whether that should also include Donald Rumsfeld's "unknown unkowns" (an expression uttered in an infamously convoluted propaganda speech by the then Defense Secretary in the run-up to the Iraq war of 2003). 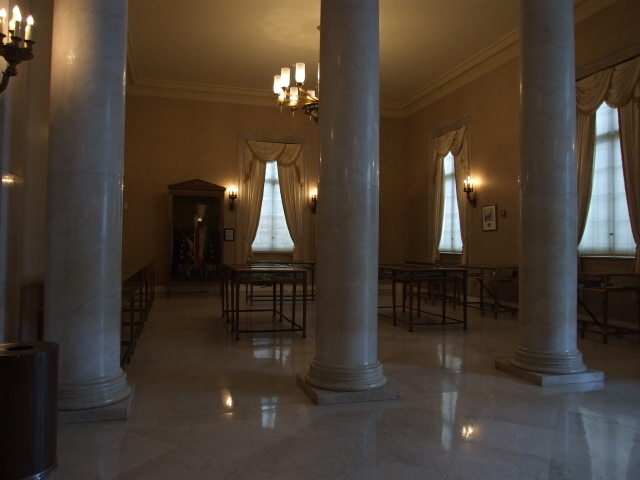 Between the Tomb of the Unknown Soldier and the Amphitheater proper is a small Display Room (open 9 a.m. to 3 p.m., closed Mondays). 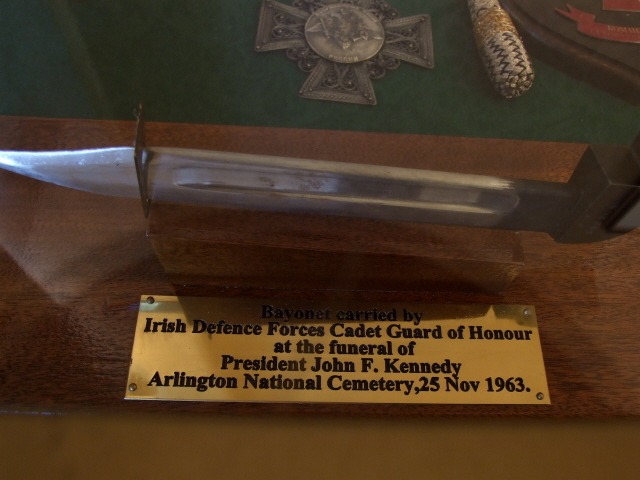 On display here are various flags and lots of medals in glass cabinets … and a bayonet carried by a guard of honour during JFK's funeral. First there is a set of three simple stone and bronze plaque memorials. 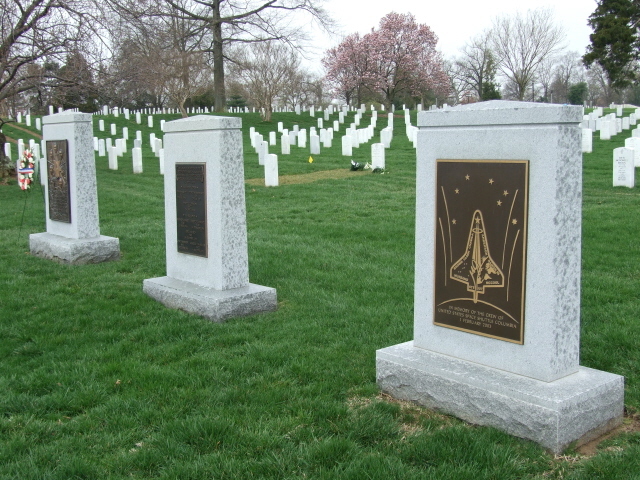 One is for the Space Shuttle "Challenger", or rather for the seven crew members who perished in one of the space age's most dramatic accidents, when the "Challenger" exploded in mid-flight, 73 seconds after lift-off, in 1986. 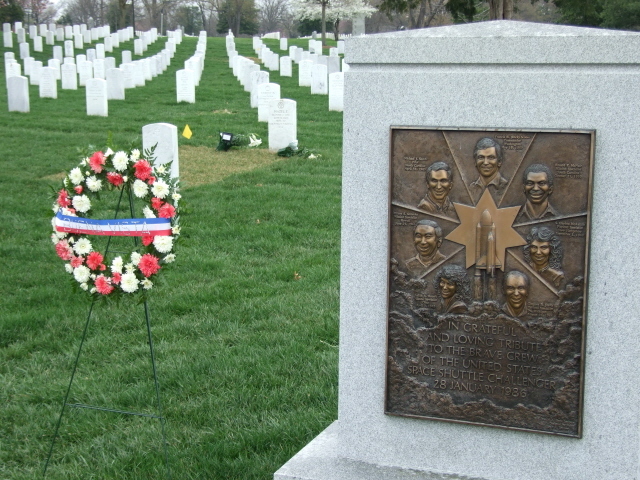 A similar memorial is dedicated to the crew of the "Columbia" Space Shuttle that was lost in 2003 on re-entry. 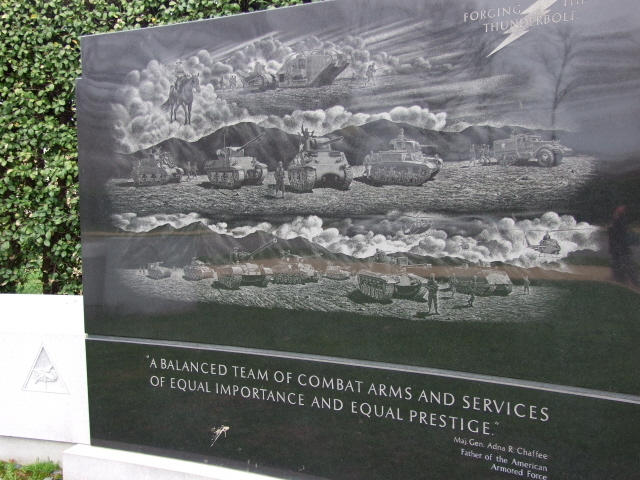 In between the two is a memorial stone honouring those soldiers killed in the failed attempt to rescue the hostages held at the US embassy in Iran in April 1980. You'll find this set of memorials en route to the conspicuous "USS Maine" memorial (for a battleship sunk in Havana in 1898) that literally stands out thanks to the ship's mast that is this memorial's centre piece. 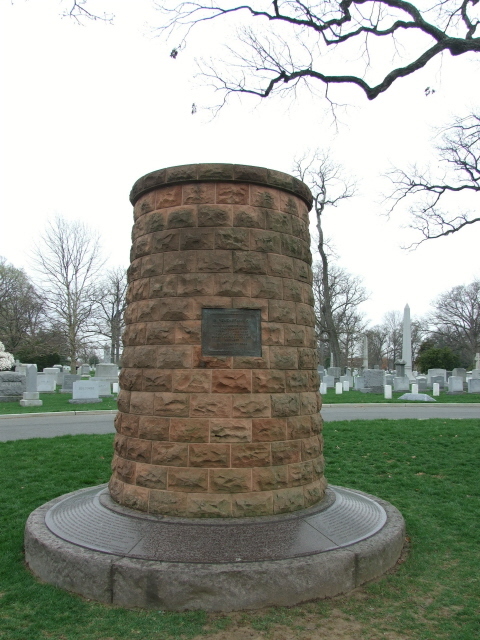 A short walk north, behind the Old Amphitheater and near the Park Ranger Station, there's another disaster marker of 20th century significance: the Lockerbie Memorial Cairn, made of 270 stones arranged as a short round cairn-like tower – in remembrance of the 270 people killed in the mid-air bombing of Pan Am flight 103 that crashed into the village of Lockerbie in Scotland, Great Britain, in 1988, which up to then was one of the deadliest acts of terrorism ever. And of course there's also a monument for the victims of 9/11, the very worst terrorist act in US history. The Arlington 9/11 monument is for those killed at the nearby Pentagon (which now has its own 9/11 monument). It's pentagonal in shape itself, and inside the remains of those who could not be identified are buried. Other victims' graves are nearby. 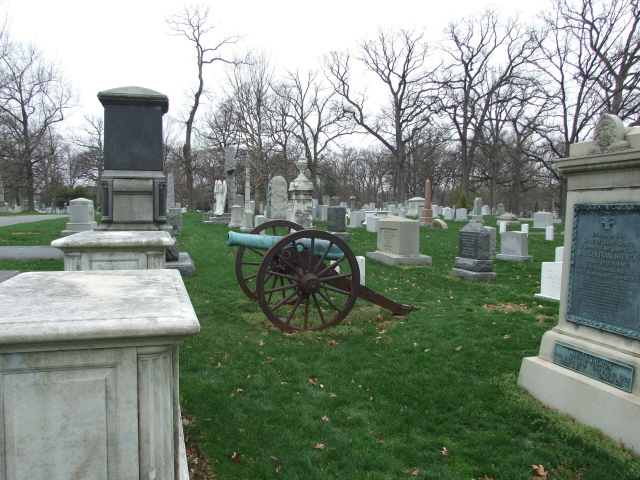 The site is in the southernmost corner of the cemetery, overlooking the Pentagon. 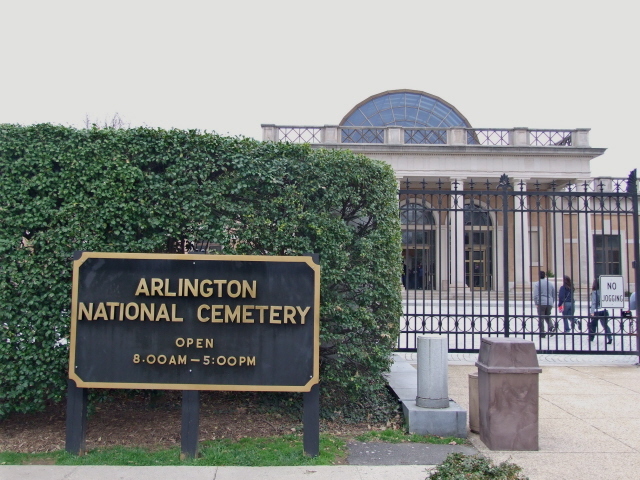 A comparatively recent (opened 1997) large-scale addition to Arlington is the "Women in Military Service for America Memorial", located right at the head of Memorial Drive past the main visitors' entrance to the cemetery. It incorporates a large semicircle retaining wall, almost amphitheatre-like again, around a reflecting pool. It's kind-of classic Greek style on the outside, combined with rather modern elements behind it. 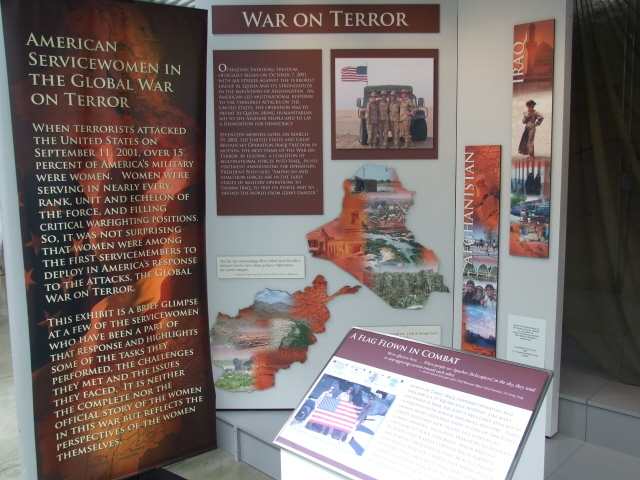 Inside is an exhibit gallery with 16 alcoves dedicated to different wars/conflicts and the roles women played in them. It's quite a contrast to the rest of Arlington to find such a museum-like concept here. But it is interesting, on different levels. For one thing, it is informative, and there are many interesting little details and stories to be found, e.g. the issue of "to pee or not to pee" – asked by women Air Force crew on nine hour long flights. 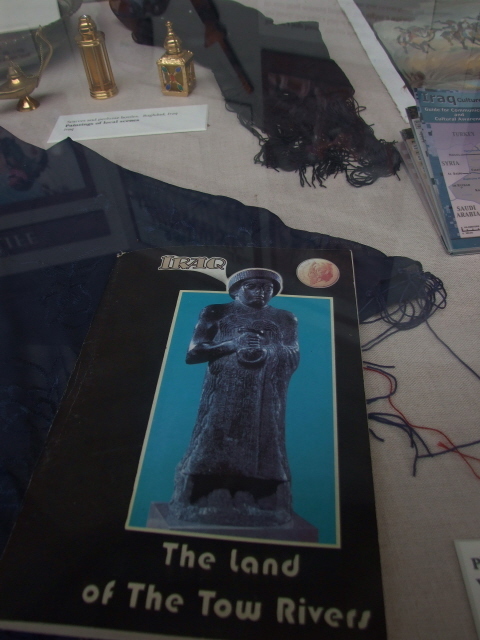 Some weird artefacts from Iraq also stand out. On the other hand, the less militaristically-minded visitor may find the propagandistic slant present in many parts of the exhibition, and in particular the pretty unabashed recruitment effort woven into the overall approach, a bit off-putting – though it's hardly surprising as such to find this here. 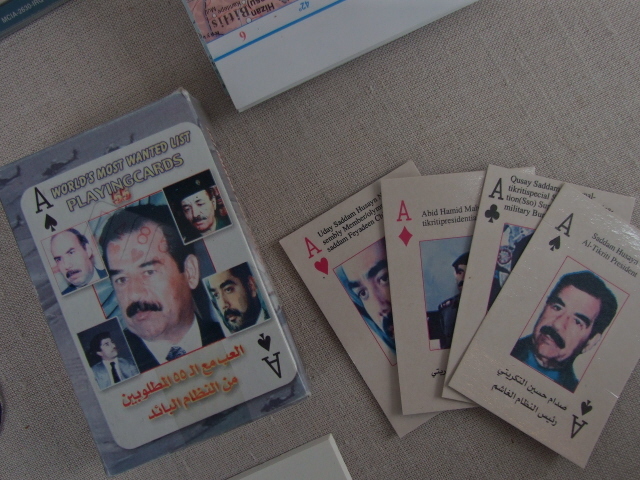 The Memorial also has its own souvenir and book shop. Another souvenir shop is at the general visitor centre by the entrance to Arlington Cemetery proper. 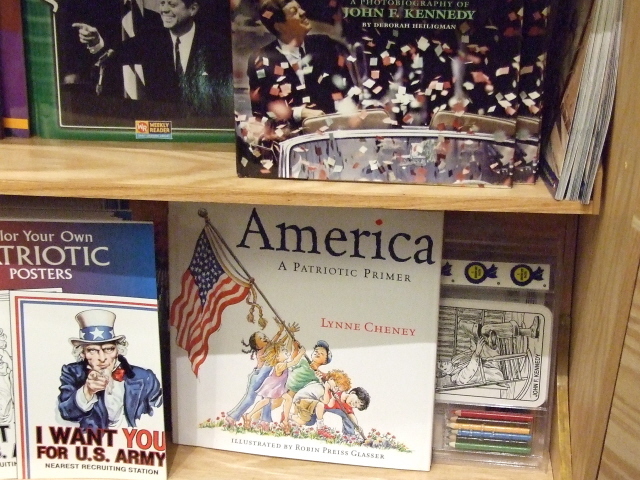 On offer are similarly disturbing items such as "Patriotic Primers" aimed at very young children. What's the message supposed to be at a cemetery? "Come and join us as early as possible – being killed in action is good fun"? Apart from the shop, the centre displays various exhibits as well, primarily flags, but also for instance a peace pipe (sic!). Its main role, however, is to provide orientation and information material. And it is indeed a good idea to pick up one of the map/info sheet brochures here before exploring the cemetery's extensive grounds. Make no mistake, by the way: this is really a big cemetery, ca. 600 acres. Not all parts will be of interest to the dark tourists, but it is possible to wander around here for hours on end. So make sure you're wearing good, comfortable shoes when coming here! Especially if you want to visit particular graves that are off the main routes described here – e.g. the graves of new arrivals from Iraq and Afghanistan, primarily in section 60, but also elsewhere. 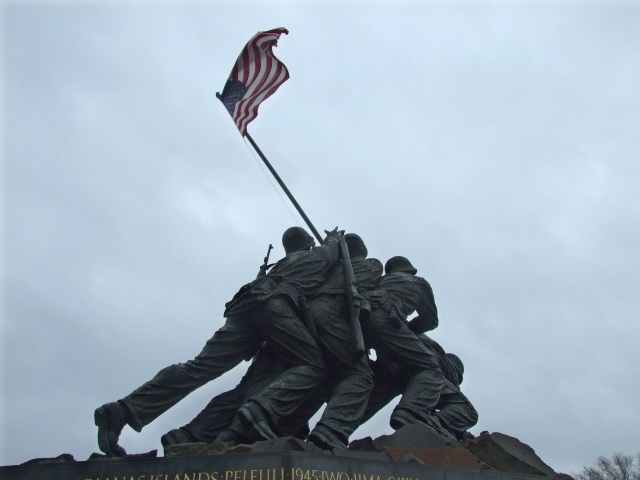 Not strictly speaking part of Arlington Cemetery, but directly adjacent to it and thus a worthwhile addition to take in when visiting, is the so-called Marine Corps Memorial, also known as the Iwo Jima Memorial. 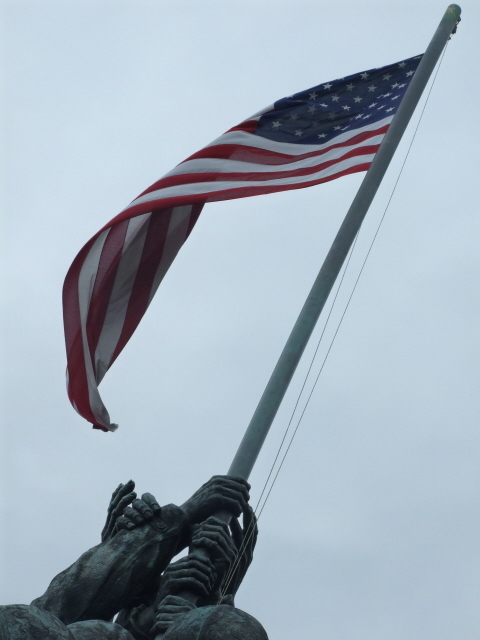 It's an uncannily familiar sight, a giant bronze group statue recreating the famous photograph of US-soldiers erecting a stars-and-stripes flag on the Iwo Jima island which the USA's and Japan's navies so bitterly fought over in the Pacific in WWII. In theory you can roam Arlington (and adjacent sites) aimlessly or in any order you like, but a sensible option is the following walking route: start at the visitor centre at the main entrance off Memorial Drive. If you want to see more than just the two most popular highlights (Unknowns and JFK), which are signposted, it's best to pick up a map at the visitor centre. Then first head either straight south to the 9/11 Pentagon monument, then, or instead if you'd rather skip that long detour, go straight up to the Tomb of the Unknown Soldier and Amphitheater. At the opposite end cross the road towards the ship's mast of the USS Maine and look out for the Space Shuttle memorials. Then head for the Old Amphitheater and past it search out the Lockerbie memorial, and only then make for the Kennedys' graves complex. After that head downhill towards the northern side-entrance (Ord & Weitzel Gate) to take in the Iwo Jima Monument and then come back to the cemetery heading for Memorial Drive and finish at the Women in Military Service Memorial exhibition. If you're not so mobile or simply less keen on walking so much there's a very touristy alternative: the "Tourmobile Sightseeing" bus/"train", a hop-on, hop-off service that travels from the visitor centre to the Kennedy gravesite, the Tomb of the Unknowns, Arlington House and back. The fare is 7.50 USD – tickets are sold in the cemetery's visitor centre. Rides depart every 20 minutes from 8:30 a.m. until half an hour before closing. En route, the ride is "enhanced" by narrators relating "accounts of heroism and personal sacrifice" (if you can bear such things … I couldn't). Location: not strictly speaking in Washington, but in the Arlington suburb located in Virginia just across the Potomac River, but it's as good as in the city … right next to the Pentagon. The main entrance is on Memorial Drive south-west of Arlington Memorial Bridge and just off N Jefferson Davis Hwy (Rt 110). Access and costs: fairly easy, but involves much walking; free. Details: Washington's WMATA Metro train (blue line) serves the cemetery as the easiest and quickest way of getting there independently (the station is conveniently named after the cemetery). The cemetery is also right next door to the Pentagon (but not easily accessed from there on foot, as I found out – instead I had to get the Metro from there for the one stop to Arlington). 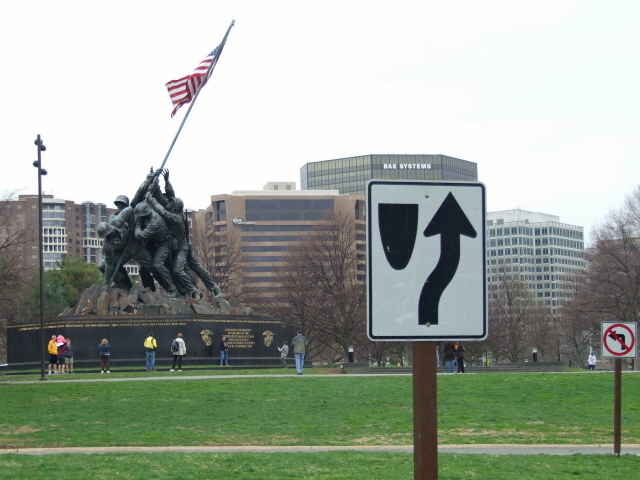 From downtown Washington D.C. you could also walk it – from the western end of the National Mall (where the Vietnam Veterans Memorial is), around and to the back of the Lincoln Memorial and across Arlington Memorial Bridge which yields into Memorial Drive leading to the visitor centre and the Women in Military Service Memorial. One sensible option is to take the metro one way, and walk to or from downtown Washington the other way, esp. when combining the trip with a visit to the National Mall (esp. the Vietnam Veterans Memorial). Of course, if you have to drive, you can do so too – there's a dedicated parking lot. Opening times: year-round from 8 a.m. to 5 p.m. or 7 p.m., in winter or summer, respectively (season change dates are 1 April and 30 September). Admission free, however, parking fees are levied for those who come by car (not recommended and unnecessary for anybody who's halfway mobile, as the place is so accessible on foot or by public transport – see above). Time required: very much depends … to see it all you could probably spend days here, but that would be too extreme for most visitors, who will typically rather make do with a loop to just the most famous spots and/or those of the darkest significance (as outlined above). Such a route can be done in two to three hours. Using the "Tourmobile" makes getting from spot to spot easier, but doesn't necessarily save that much time. Also note that you'd still need to walk all the way to the Iwo Jima Monument and back as the Tourmobile route goes nowhere near it. Combinations with other dark destinations: the Pentagon with its 9/11 monument is just to the south of Arlington Cemetery – in fact from the hill you can see the huge hulk of the Pentagon building (and the planes flying close past it towards the National Airport behind it). However, I found it not to be possible to simply walk between Arlington and the Pentagon and had to take the Metro (blue line) one stop. The National Mall with the Vietnam Veterans Memorial is just a bit over a mile (1.7 km) away from the cemetery's main entrance, across Arlington Memorial Bridge. From the bridge you can see the Watergate complex to the north, just behind the Kennedy Center. Further east, either side of the Mall, many of Washington's other dark destinations are lined up, esp. the US Holocaust Memorial Museum and the Newseum. 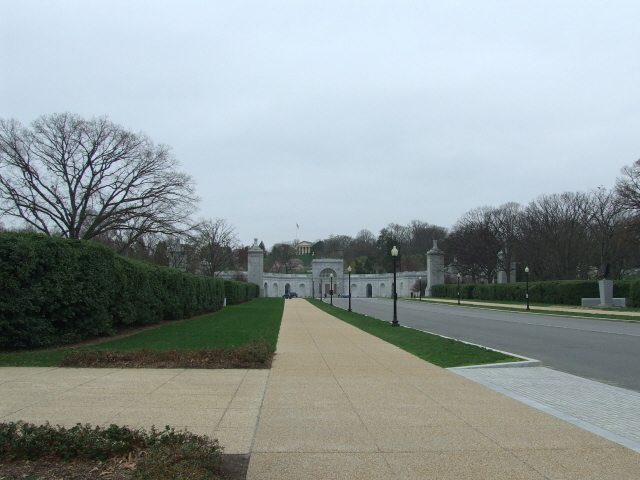 Combinations with non-dark destinations: in a way, Arlington Cemetery can also count as a non-dark attraction in itself, because of its pleasant park-like lay-out. There's also plenty of bird life to be spotted for those who get a kick out of that. And the view across Washington's skyline dominated by the Washington Monument and the Capitol is also worth the trip even for those not so interested in the famous graves etc.